Last week, one of the members of our FCFNY Fitness Family asked me about the creamer she used in her coffee. She love the taste of French vanilla, and frankly, who doesn’t? As we talked about it, she said she opted for the fat free version. While I admire her for making the effort, like many, she got fooled into thinking “fat free” is healthier. 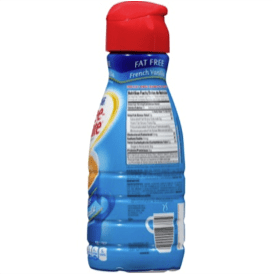 Problem is, while a “fat free” label implies a healthier product, when you look into the details on the other side of the bottle, you learn it’s just the opposite. It’s all a marketing trick to get you to buy something that, if they actually labeled it for what it is, you likely wouldn’t go near it. All of which is perfectly legal I might add. Let’s look at our French vanilla coffee “friend” mentioned above, and let’s look at the nutritional information. *the “fat free” saves you a “whopping” 1.5 grams of fat, as compared to their regular version. Now, at first glance, none of this looks too bad. But, here’s the thing: First off, most people pour much more than one tablespoon in their coffee — more like two or three times that much— and, second, most people have more than one cup a day. But, as bad as that is, it’s when you look at the ingredients that the real nutritional nightmare becomes apparent. I went to the product’s website to attempt to find the ingredient list. Frankly, I’d have a better chance of finding a unicorn than I would the ingredient list. If that doesn’t scare you, it should certainly concern you. But, perseverance paid off and I was able to find it from another source. The first ingredient is water. Okay. I think we can agree water isn’t a bad thing. I’d argue most of us need more of it in our diet but that’s where the “good” ends. The second ingredient is sugar. How much? Well, we don’t exactly know but since there are five grams of carbs, we can assume there’s at least a teaspoon of sugar, beecause a teaspoon is equivalent to four grams of carbs. The next ingredient listed is vegetable oil, specifically high oleic soybean or canola oil. Yes, our product is technically fat ree, but that doesn’t mean they don’t make this stuff out of oil. Finally, the list of ingredients that falls below the mandated two percent includes mono and di-glycerides, dipotassium phosphate, artificial flavors and sodium caseinate. Try saying that three times fast! What don’t you see in the ingredients for this CREAMER? Well, for one, there isn’t a lick of cream in it. What else isn’t in the ingredient list of this vanilla flavored frankenfood? Well, vanilla, of course. Friends, your coffee creamer this isn’t a natural product. This is something concocted in a lab and is custom tailored to do one thing, get you to use as much of it as possible. On top of all that they have the audacity to list on the package that it’s “dairy free,” “fat free” and “gluten free” all in an attempt to trick you into believing it’s healthier than it actually is. Much like my client, millions of people use this stuff everyday thinking it’s a better alternative than half and half because it doesn’t have fat in it. So, what should you use? Well, most will say to drink your coffee black, but I just can’t do that, myself. I use half and half, and no not the fat free kind. Yes, it has a few more calories (40), and a bit more fat (three grams), but there is no added sugar. There’s only one gram of sugar, what naturally occurs. And, you even get a gram of protein. That also accounts for a serving size of TWO TABLESPOONS, double the suggested serving of the fat free product. Put another way, true half and half actually has fewer calories than the fat free creamer. I think we can agree there’s a significant difference in that ingredient list from the other. Yet, people will opt for the FrankenCreamer over the real stuff because it’s “non-GMO.” Of course it’s non-GMO, because it isn’t actually food! Folks, do yourself a favor and stop trying to ‘cut calories’ by buying things that are made in a lab. Take the time to read the labels and educate yourself on what you are actually consuming. Your life and health depend on it. Oh, and if you want the vanilla flavor, buy some real vanilla pods. Take one and split it in half. Then. add it to your to your carton of half and half. Give it a shake and wait a day or two. The vanilla will infuse into the half and half. You’ll be surprise at just how better the real flavor tastes. Dan Romand is co-owner and operator of Full Circle Fitness-NY in Colonie (and soon to be Saratoga Springs), where he is also a certified personal trainer. 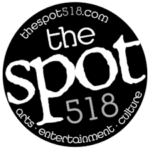 You can often read Romand’s Health and Fitness column here in TheSpot518 and online at TheSpot518.com.